Amelia M.L. Montes: Thank you so much, Stephanie, for joining us today on La Bloga! 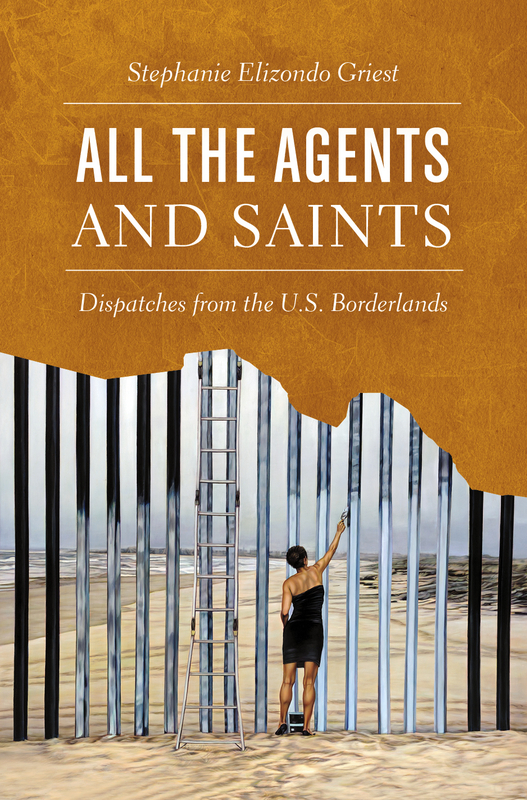 Your book, All the Agents and Saints: Dispatches from the U.S. Borderlands is an important and compelling perspective because we learn current issues occurring on the Texas southern border in tandem with what is happening along the Canadian border, an area not often discussed and much less talked about. This border is situated as you say on page 148: “…north of the Hudson, north of the Catskills, north of the Adirondacks . . . the only thing it’s south of is Ottawa.” You became acquainted with this area due to a year position at St. Lawrence University in Canton, New York. Tell us how you came to decide on living in that area of the U.S. for a year. Was it difficult to acclimate at first? Stephanie Elizondo Griest preparing to cycle across the New York/Quebec border. Average wait time in this isolated stretch: 3 minutes. At nearby Akwesasne, crossing can take upward of 2 hours, due to regulations requiring motorists to check in with Canada before visiting certain parts of the Nation. Photo by Betsy Kepes. Stephanie Elizondo Griest: Primero, mil gracias for the invitation, Amelia! It is beautiful to be here. I am a native Tejana whose family has a 150-year history in the southern borderlands, but I didn’t know anything about the northern border until I landed a professorship eighteen miles from Canada. It was quite a shock to the system, gravitating from one of the hottest regions of the United States to one of the coldest. (They joke about having only two seasons there: winter and July.) But once I started exploring the nearby Mohawk Nation of Akwesasne, I was struck by déja vu. Just as my Tejano ancestors had preceded the U.S./Mexico borderline by centuries, the Mohawks had, too—by millennia. Many Tejanos no longer speak Spanish because our elders had it humiliated out of them in public schools; ditto with Mohawks during their century of Indian Residential Schools. Our vaquero elders lost their traditional lifestyle because of corporate buyouts of ranches. Mohawks can no longer support their families hunting, trapping, or fishing due to the opening of the St. Lawrence Seaway. Too many of our youth are imprisoned for smuggling; theirs, for trading. In borders north and south, we must contend with the trafficking of firearms right through our neighborhoods. We die in frightening numbers from diabetes caused by obesity wrought by poverty. We grieve the loss of our land, the loss of our culture, the loss of our dignity. Before long, I realized we were living a parallel existence. And it didn’t feel like a coincidence. Border Patrol agents force migrants to leave behind their shoelaces, belts, and toothbrushes before boarding their vehicles, lest they be turned into weapons. Photo by SEG. What steps did you take, first—overcoming your fears, and second, in “writing with respect” to avoid spreading injustice? Mohawks marching in protest over the Three Nations Crossing bridge that purportedly "unites" Akwesasne with Canada and the United States, wearing traditional headdresses called kastowa. Photo by SEG. Stephanie Elizondo Griest: This was, without question, the hardest aspect of writing this book. Having witnessed the egregious portrayal of our own Latinx community time and again in the media, I greatly feared perpetuating the stereotypes of another community—especially one that has withstood so much tragedy. But the more I learned about the Mohawk Nation, the more I realized we shared too many upsetting experiences to ignore. So I proceeded with as much openness, respect, and diligence as I could muster. In addition to reading dozens of books and hundreds of articles about Akwesasne, I visited the Nation several times a week for a year, interviewing anyone willing to talk with me—clan mothers, steelworkers, security guards at the casino, nutritionists, teachers, drug dealers, artists, faith keepers, newspaper editors, activists – for as long as they allowed, at truck stops, sushi bars, family homes, smoke shops, the senior center, the Longhouse. People tended to be guarded when I first approached, but once I revealed my own border origins and pointed out our commonalities, many Mohawks took an interest in my project. A few became close friends and graciously served as advisors throughout the researching and writing of the book. This is not to suggest that All the Agents and Saints escaped the trappings of colonial literature. Any time an Outsider writes about Native people, they are participating in that “othering “ tradition. It just means that I made every attempt to be as conscientious as possible. Amelia M.L. Montes: The book is divided in half. The first ten chapters are devoted to the Texas-Mexico Borderlands (your title for this section) and another ten chapters are your experiences from the New York-Canada Borderlands. Was it ever a different configuration or did you know this is the way the book should be shaped? Stephanie Elizondo Griest: My goal was to recreate the déja vu I myself experienced relocating from the southern borderland to the northern one. Practically every story I’d heard growing up in South Texas was echoed at some point that year at Akwesasne. To illustrate that, I split the book in two, with each chapter in the first half having a corresponding soul mate in the second half. Together, these two halves form a testimonio, or document of witness, of life on the periphery. Amelia M.L. Montes: It works very well. I can see how reading two corresponding chapters can really clarify the struggles south and north. Did this new configuration make the writing of THIS book different from your previous books? What is one thing you learned that you hadn’t realized before? Stephanie Elizondo Griest: I was 23 years old when I started writing my first book, Around the Bloc: My Life in Moscow, Beijing, and Havana. I had taken reams of notes while traveling because Journalism School trained me to do so, but I hadn’t asked the sorts of questions or conducted the kinds of research I would have if I had known a book was a possibility. So writing that book was agonizing. It ate up my entire twenties, and made me sick with worry that I was just wasting time. With the next book (Mexican Enough: My Life Between the Borderlines), I had high hopes that my travels in Mexico could lend themselves to a book, so I conducted non-stop research. Yet, I couldn’t shake the fear that Around the Bloc was a fluke and I was not just squandering my own time, but that of everyone I interviewed as well. All the Agents and Saints was the first book where I managed to shake the fear of time. I finally accepted that the kind of books I write take an obscene amount of work that lasts upward of a decade and induces the full expanse of human emotion with an over-abundance of the bleaker moods. This realization has been liberating for me. I finally trust my instincts. I finally have patience with my process. Amelia M.L. Montes: Wonderful! I can see a progression in each of your books. They all bring important experiences and perspectives to our understanding of identity and intersectionality along the border. And in this third book, you bring us a broader outlook, inviting us to make connections across cultures and geographic spaces. Is there anything else you would like to share with La Bloga readers? Stephanie Elizondo Griest: Let me first extend gratitude to everyone for creating such a supportive space for Latinx narratives. And second: I’d love to see y’ all on the road! I’ll be spending the rest of the year on book tour, with stops in Washington DC, Boston, Chapel Hill, New York City, the North Country, and all over Texas. Check out my website for deets: www.StephanieElizondoGriest.com Gracias! Stephanie Elizondo Griest along the border wall near Brownsville, Texas. Photo by Susan Harbage Page.